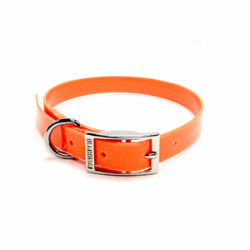 Plastic coated Biothane collar in Hot Orange. Easy clean and care for active outdoor dogs. Available in 1" width x 16", 18", 20", 22", and 24" lengths. Options: 16" 18" 20" 22" 24"